Designing professional development opportunities for teachers can be both exciting and challenging. Historically, PD sessions have been delivered in a very traditional format. This involves bringing a group of teachers together who have a common interest (grade, course, subject, school etc.) and delivering a common message. A simple example is the in-servicing of new curriculum. When the Department of Education, Early Learning and Culture (DEELC) launches a new curriculum they are required by contract to provide in-service to the teachers. In P.E.I, the DEELC is responsible for the development of the provincially authorized curricula; it is the responsibility of the Public Schools Branch, (as the employer), to ensure this curricula is implemented. The very nature of this structure can lend itself to an autocratic and top-down system. The epistemological assumption embedded within this structure is that the required knowledge is held by the developer of the curriculum, (DEELC), and it is the responsibility of the developer to impart this knowledge to the teachers. One of the unintended consequences of this can often be autocratic and top-down in-services and/or professional development (PD). The challenge presented by the structure is real; and is exemplified when the subject matter is as diverse as Career and Technical Education (CTE). To provide some context, CTE programs in P.E.I. range from culinary arts to autonomous robotics, from grade 7 wood shop to preparing students to write apprenticeship exams in welding, and from architectural drafting to career exploration. The idea that the required knowledge is held by the developer is impractical. My current role as the CTE curriculum specialist for the DEELC has provided me the opportunity to develop and deliver a number of in-services over the past 12 years. Some were better then others; some were autocratic and top-down, others were more constructive and pragmatic. I believe the true centre of knowledge in education is not located within the bureaucrat structures of school governance, but rather in the schools themselves and more specifically, within the teachers. I am not dismissing the role of curriculum, principals, students, parents, or the litany of specialists we lean on within our schools, rather stating that the teacher, and their pedagogy, is what forms the necessary connections to make the system function. This is why I found the alternative PD structures in this artifact so interesting. It challenges teachers to take back their professional learning and recognize what they have to offer each other. As a curriculum specialist, this has also challenged me to consider ways to empower teachers to share in the ownership of the curricula. John Hattie describes collective teacher efficacy as having the greatest influence on student achievement. “Collective Teacher Efficacy is the collective belief of teachers in their ability to positively affect students” (Hattie – website). 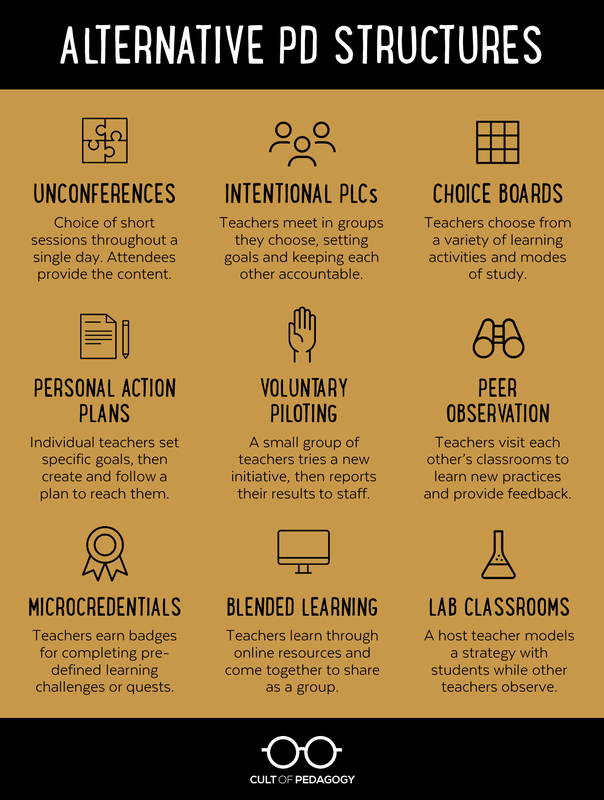 As I reflect on my work through this lens of alternative PD structures, I can see where I have drawn on some these structures past in-services and PD sessions. I have incorporated peer mentoring, blended learning, and elements of voluntary piloting; however, I would argue that I have came to these unintentionally. The challenge moving forward will be to make some these structures more intentional and challenge teachers to be active centres of knowledge within the curriculum and leaders of their own pedagogy and professional development.